Give the best diet to your cat with Cat Chow Adult with tuna and salmon. Made with tuna, salmon, herbs and vegetables, this balanced cat nutrition has protein, fat and carbohydrates that contribute to the good health of your pet. 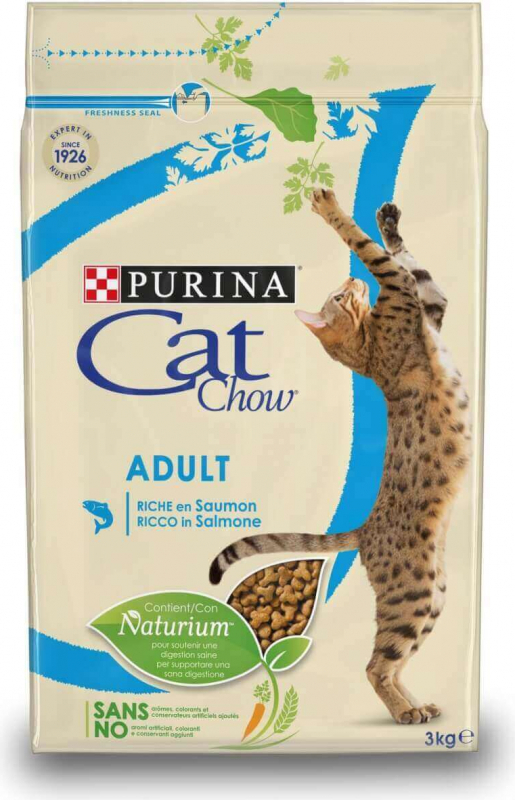 Cat Chow Adult provides calcium and phosphorus needed to strengthen bones, joints and teeth. Fatty acids Omega 3 and 6 ensure the quality of the coat and skin and antioxidants strengthen the immune system of your cat. Protein 34%, fat 12%, crude ash 7.5%, crude fibre 2%. Cereals*, vegetable protein extracts, meat and animal by-products (meat 14%), oils and fats, fish and by-products derived from fish (salmon 4%, tuna 4%), vegetables * (dried chicory root 2%, carrot 1.3%, spinach 1.3%, peas 1.3%), by-products of vegetable origin (dried beet pulp 2.7%, parsley 0.4%), yeast *, minerals. * Natural ingredients.